Uth Creative has been awarded the creative duties for Carlsberg Hong Kong’s Sevens sponsorship, with a martial arts-inspired digital campaign launched yesterday. With a social media focus, the campaign introduces a Kung Fu Rugby team for the new brand identity “Carlsberg do it better. Probably”, which aims to send a message that “whatever Carlsberg strive to do, Carlsberg do it better”. The punchline is inspired by Carlsberg’s long-standing advertising slogan – “Carlsberg, probably the best beer in the world” (嘉士伯-可能是世界上最好的啤酒). 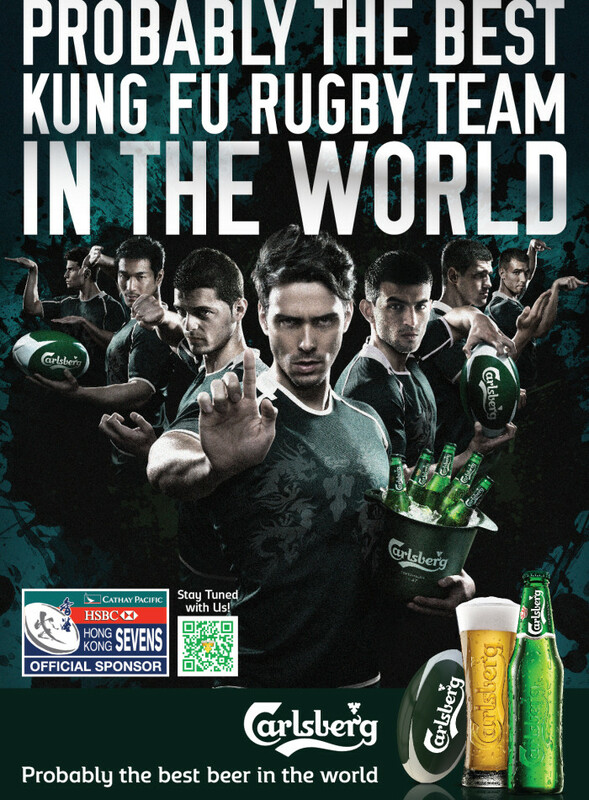 “Unlike other countries’ ordinary rugby, Carlsberg’s rugby in Hong Kong would apply Kung Fu skills to play rugby making Carlsberg’s rugby team the best in the world probably,” said Bianca Tam, senior account director at Uth Creative. The martial arts-inspired piece comprises of a key visual that shows seven rugby players demonstrating seven different signature Chinese Kung Fu styles, while the Chinese essence has been enhanced by the Chinese brush drawing ink as the background. “The rugby player holding a bucket of Carlsberg in the middle also implied that Carlsberg was the only beer worth fighting for and hence Carlsberg,” she added. To make the Kung Fu idea alive, an elite group of martial artists who were instructed by the legendary Kung Fu star, Yeung Pan-pan, will perform a special Kung Fu Rugby performance in the Hong Kong Stadium on 29 March. The campaign marks the first project between Uth Creative and Carlsberg Hong Kong since the brewing company dropped WPP agency JWT from its roster after a two-year partnership earlier this year. According to a spokesperson from Carlsberg Hong Kong, the company has called a global creative pitch, mainly in Europe; while creative services for its operation in Hong Kong has handed temperately to Uth Creative. The spokesperson added Carlsberg has no intention to name an agency-of-record in Hong Kong in the near future, but that Uth Creative will “probably be our long-term creative partner” looking down the road.